A die is rolled two separate times. What is the probability that the first roll is a 4, and then the second roll is a 2? A die is rolled two separate times. What is the probability that the first roll is 2, and then the second roll is an even number? A die is rolled and a penny is tossed. 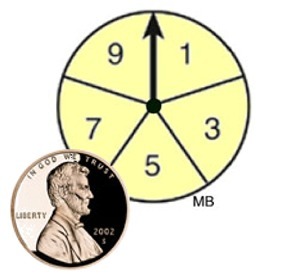 What is the probability that an odd number is rolled on the die and a tail is tossed on the penny? 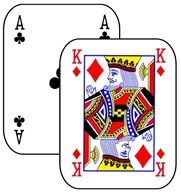 Two cards are drawn from a standard deck of cards. The first card is not put back into the deck after being drawn. 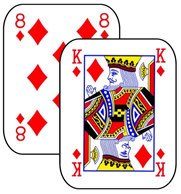 What is the probability that the first card is an ace and the second card is the king of diamonds? A sack contains fifteen chips numbered from 1 to 15. 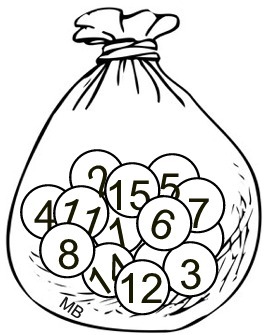 Without looking in the sack, you draw a chip, record the number, return the chip to the sack, and then draw another chip. What is the probability of drawing an even number, and then drawing an odd number? Two cards are drawn from a standard deck of cards. The first card is not put back into the deck after being drawn. What is the probability that the first card is a diamond or the second card is face card? A coin is tossed and an equally divided spinner (as shown) is spun. What is the probability of a head on the coin or a prime number on the spinner? A penny is tossed three times. What is the probability of getting heads on all three tosses? During scheduling, the probability that a college student will choose English is 40%, that he/she will choose Math is 30%, and that he/she will choose both English and Math is 20%. What is the probability that the student chooses English, Math, or both? You roll a die. You then spin a spinner equally divided into four sections labeled with the letters A, B, C and D. What is the probability of not rolling a 1 on the die, and spinning the letter B?